Log home maintenance problems can come in all sorts of shapes and sizes but here is one that we hear about at least once every summer – porcupines chewing on the logs. 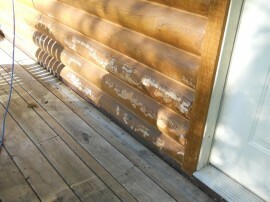 In fact, three times over the last two months we have fielded calls from log home owners that have had this issue. This photo is a good example of the damage they can cause. “Porcupines chew on all kinds of things…either to sharpen their teeth or because of some attraction in the glue, paint, sweat or whatever is on what they decide to chew on. 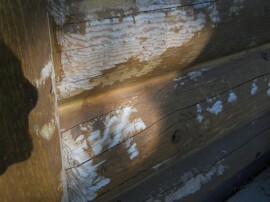 Siding is usually attacked because of the bonding glue in plywood. 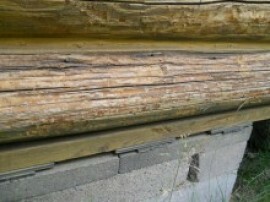 Logs, as such, should not be much of an attraction unless whatever stain or preservative that is on them is attractive. If your home is under attack by porcupines, you may want to consider following Scott’s advice, at least in the short run. If a porkie is gnawing off the finish on the logs, it is a good idea to take some measures to prevent it from continuing. At that point you will re-apply a good finish on your logs home. To do this you will need to sand down the logs and reapply the stain.